We tested the anticoagulation activity of free RNA aptamers, RNA origami tethered RNA aptamers, and DNA tiles bearing DNA aptamers using aPTT assay (activated partial thromboplastin time assay). Non-modified RNA origami with aptamers showed no anticoagulation activity, because it was rapidly degraded in plasma. The anticoagulant activity of RNA origami is at least six-fold higher than that of free aptamers. To test anticoagulation activity of RNA aptamers on origami. To find the optimum RNA origami that offers the highest anticoagulation activity. Coagulation in human blood is the result of a complex series of reactions between various proteins in the blood called the Blood Coagulation Cascade (BCC). The aptamers used in the DNA/RNA tested here bind to one of the proteins in the BCC, thrombin. By targeting thrombin with DNA/RNA aptamers, the BCC can be inhibited, preventing, or at least slowing, coagulation. There are two exosites on the thrombin molecule that have already been targeted with DNA and RNA aptamers, called exosite 1 and 2. DNA aptamers patterned onto DNA weave tiles have been shown to effectively inhibit coagulation in human blood, however, RNA origami patterned with RNA aptamers had not previously been tested. One problem with RNA origami is that it is unstable in human blood plasma, therefore it needs to be modified with fluorine on the 2’ carbon in the ribose sugar in order to survive. Inhibition of the BCC can be tested using an aPTT assay using a coagulometer. aPTT assays work by taking pooled human blood plasma which is Ca2+ deficient, and adding necessary reagents to work as surface activator. The surface activator begins the intrinsic path of the BCC, however, the lack of Ca2+ prevents the activation of factor IXa, preventing the common pathway of the BCC. The thrombin binding construct is then added to the sample, and is left to incubate. After incubating for five minutes, CaCl2 is added to the solution, kick starting the common pathway of the BCC and beginning coagulation of the sample. The time it takes the sample to fully coagulate starting from the addition of the CaCl2 is measured via the movement of a metal ball through the sample using magnets. When the ball stops, the sample is said to have completely coagulated. Using this method, the efficacy of the RNA constructs were determined. In order to give a comparison for the RNA origami, the previously created DNA aptamer patterned on DNA tiles were tested (4). RNA aptamers 1 and 2 corresponding to DNA aptamers P and B. Both fluoro-modified and unmodified RNA constructs were tested to showcase the ability of the modified RNA’s ability to survive in blood plasma. For the anticoagulation test, four aptamer arrangements for both DNA and RNA were tested in a Model ST4 coagulometer from Diagnostica Stago. No anticoagulant activity was observed for any non-modified RNA origami for all four aptamer arrangement designs, because non-modified RNA origami was degraded in human plasma very rapidly. The modified free aptamer offered low anticoagulation activity. The clotting times for exosite 1 and exosite 2-binding RNA aptamers were 37 and 52 seconds, respectively. The modified RNA origami tethered RNA aptamers showed remarkable activity compared to unmodified RNA tiles and free aptamers with coagulation times between 150 and 240 seconds. As expected, no anticoagulation was observed for modified RNA origami without RNA aptamers (2HF-RNA-NNNN) and for DNA tiles without DNA aptamers (2HT-DNA-NNNN). The anticoagulation activity of modified RNA origami was six-fold higher than free RNA aptamers (Figure 2). Additionally, the DNA aptamers presented on DNA tiles provided the same trends in anticoagulation activity as discussed previously in the literature, and have similar magnitudes of activity (4). 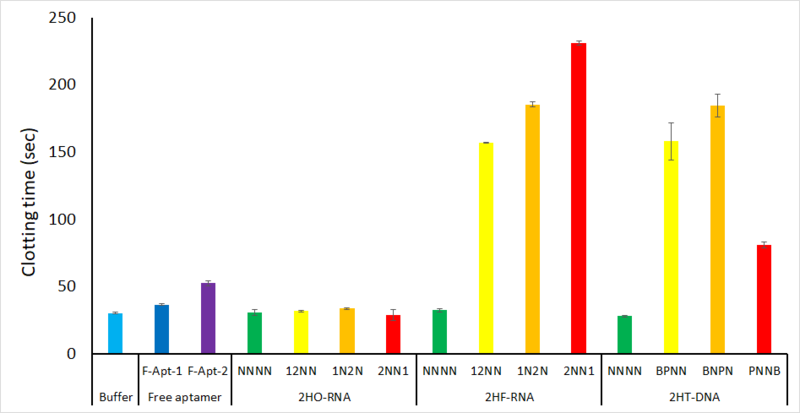 Figure 2 Comparison of average clotting times of free RNA aptamer, non-modified RNA origami (2HO-RNA), modified RNA origami (2HF-RNA), and DNA tiles system (2HT-DNA). Error bar is standard deviation (N=3). The results show that anticoagulation activity of modified RNA was greater than the DNA tiles system. The 2HF-RNA-2NN1 was shown to be the most effective of all the tiles in coagulation inhibition. This design was chosen for further experimentation in this project. The RNA origami tiles with RNA aptamers successfully inhibited the coagulation cascade and displayed marked anticoagulant activity. The activity is six-fold higher than for free aptamers. The results confirm that the modified RNA survive for significant periods of time in human blood plasma. These two facts encourage further examination of RNA origami as a potential anticoagulant in surgical applications. The coagulation test was run in an activated partial thromboplastin time (aPTT) assay with a model ST4 coagulometer (Diagnostica Stago). 50 μL Pooled human plasma (George King Bio-Medical) was added in each cuvette, mixed with 50 μL aPTT reagent (TriniClot), and left to incubate at 37 °C for 5 minutes. 16.67 μL of 5 μM RNA origami sample, or buffer, was then added and incubated for an additional 5 minutes at 37°C. To activate clotting, 50 μL CaCl2 solution was added. The final concentration of RNA samples was 0.5 μM. The time to clot was then measured by the coagulometer and recorded. Long, S. B., Long, M. B., White, R. R., and Sullenger, B. A., Crystal structure of an RNA aptamer bound to thrombin, RNA. 2008, 14, 2504-12.